Kaveh Akbar’s poetry is captivating not only for its beautiful turn of phrases but also for its more profound musings in evocative lines that linger: “eternity looms/ in the corner like a home invader saying don’t mind me I’m just here to watch you nap”. 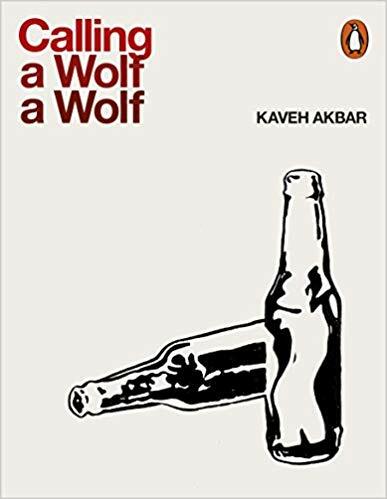 Yet Calling a Wolf a Wolf isn’t simply a sum of various poetic features executed well ‒ so well executed, and at times quite brilliantly so, that reading becomes quite literally a guilty pleasure. Akbar seems aware of how personal issues affect his art; he writes with rich metaphors and images, yet he also handles difficulties well. It would be easy for Akbar to offer a collection which consists merely of well-painted images but, instead, he gives a new perspective on the troubling issues at hand. Whether it is correct to enjoy this “from a dark place” work is a separate conversation to be had outwith this review. An Iranian-American poet whose work has appeared in several major publications such as The New Yorker, The New York Times, Poetry Magazine and many more, Akbar’s latest collection, Calling a Wolf a Wolf, deals with his relationship with addiction, his grappling with faith and desire, and the issues that arise from those conflicts. Akbar’s poetry is written as personal as you would expect from a poet actually confronting the issues that he is. Needless to say, the poetry is dark and compelling. Imagine being the oil boiling away an entire person. Today, I’m finding problems in areas where I didn’t have areas before. in graveyards drinking coffee     forking soapy cottage cheese. At times you can imagine these poems being read in one breath without pause, to convey the pouring of emotion; at other times the reader can play with cadences and stresses, thus choosing which lines to emphasise. This makes repeat readings different. A complicated relationship arises between artist and audience when the work comes from a dark place. Th art can be very moving, engaging and is often amongst some of the artist’s best but its price can be the creator’s own physical, mental or emotional well-being. As a result, enjoyment of art that is born out pain and conflict, puts us in an uneasy moral place.